Noe Perez is one of our most diverse staff members and you'll find his smiling face in the shop, in the drift boat, in the shop, and on the shooting range. He hails from White Salmon, Washington, not far from the Klickitat River, and has always loved doing anything and everything outdoors. He is studying at Central Washington University and plans to be a Physicians Assistant. Noe loves elk hunting, fly fishing, and makes an Avocado salad that you would die for. He is a man of many skills. Well winter fishing is finally upon us. This means many anglers have hung up their rods and waders for the year, for some of us this is our favorite time of the year. Its definitely not about how many fish you catch this time of year, nor the dry fly action. 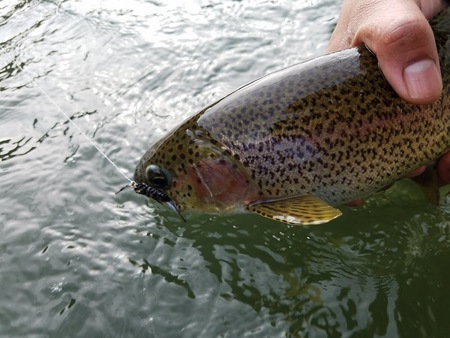 Anglers hit the water to enjoy the finer things about fishing, such as fewer anglers on the water, less fishing pressure, and the chance of hooking some quality fish. The mild weather this winter has given us some beautiful fishing conditions along with some very good fish in the net. Dont be afraid to hit the snooze alarm a couple times throughout winter months, as there is no need to be up at the crack of dawn and race down to river. Fishing will be temperature driven which means you can get up and enjoy a hearty breakfast before you head out. This also means fish will congregate into larger pools and runs, so we dont have to fish every inch of the river to find them. Heres a couple of my favorite winter patterns. Winter fishing you will want to get to your spots and take your time working them over as the fish can and will change where they sit day by day. This could be for a variety of reasons such as a cold night or some cloud cover. What you need to know to find them is that when the water temps get low they will want to sit in bigger pools and runs where they dont have to expend a lot of energy and can pick up the occasional snack. It may take some time to figure out exactly where they are sitting but you are generally looking for a deeper area 3-6 ft. deep with a slow walking pace. If there are some boulders or a drop off thats a bonus. The next part to catching winter fish is getting your flies down to them. 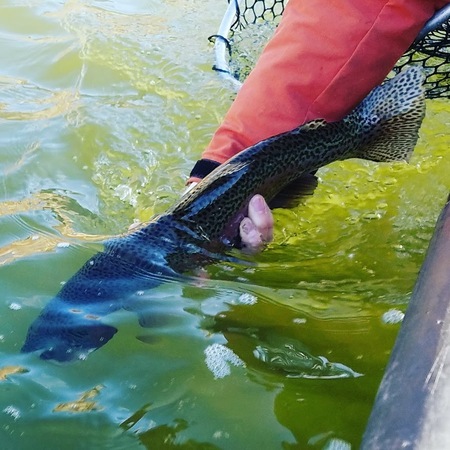 Generally I will run no weight or a smaller split to get help get my flies down and I am generally fishing a bit deeper than I would other times of the year. Depending on the area Im fishing I generally run 4-6 ft. from my indicator to my top fly and 18-24 in to my second fly. If Im running split I put it about 18 in above my first fly. For an indicator I go between a ¾ in airlock or yarn. I like the airlock to help tapalong the bottem of the deep pools, but some days you will get a lot of very suspicious bobber downs and little to no hook ups. On those days I will shorten up just a hair and swap to my yarny which will help see those more quick subtle takes and produce more hook ups. Daren, Welcome to WA, and while we appreciate your enthusiasm, Yakima River steelhead are an endangered species and illegal to fish for. Your best option for Spring steelhead fishing is the OP. With as mild as this winter has been, the trout fishing this Spring just may be good enough to make you forget about chasing steelies...!